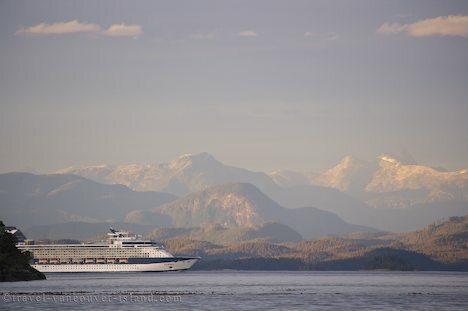 Alaska cruise passengers get a unique view of the scenic BC Coastal Mountains from their floating palace. The passengers of cruise ships which travel between Alaska and Seattle get to enjoy the beautiful scenic coastline of British Columbia as they make their way along the Inside Passage. Between May and September each year, massive floating palaces cruise through Canda's Queen Charlotte Strait, Johnstone Strait, Discovery Passage and the Strait of Georgia - scenic bodies of water wedged between the mainland of BC and Vancouver Island. During these cruise voyages, passengers get to experience the delightful mountains and coastline of British Columbia, plus an array of marine life such as Killer Whales, Humpback Whales and dolphins. A cruise ship cruises from Queen Charlotte Strait into Blackfish Sound before reaching Johnstone Strait along the scenic coast of British Columbia, Canada.